Parish festivals are great time for lots of family fun in a safe environment. 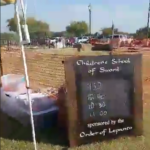 The Order of Lepanto can came out and setup a booth with Renaissance style games, or offer a “Children’s School of Sword” where we teach simple sword techniques using foam swords with NO contact. The class is sprinkled with Catholic lessons and history in order to have fun while reinforcing our Catholic identity. If you are interested, please fill out our Contact Form.